Lonnie Burr (born May 31, 1943) is an American actor, dancer/choreographer, singer, director and author, best known for having been a star on the original Mickey Mouse Club television show from 1955 to 1959.Burr was born in Dayton, Kentucky. He is of Danish, French, Scots-Irish and German descent. His parents were Howard Babin and Dorothy Burr, a vaudeville dance team that performed in film and on stage as "Dot and Dash".At age four Burr started dance lessons and was soon making live ... See More appearances on local TV shows as well as acting on radio and turned professional at five. By six he began working on national television and radio, acting in commercials and landed his first film appearance in A Yank in Korea (1950). He had his first recurring television role as the next door neighbor Oliver Quimby on The Ruggles situation comedy (1950–1951). He guest starred on such series as The Range Rider (as Jimmy in the 1953 episode "The Holy Terror"), The Colgate Comedy Hour, The Roy Rogers Show, The Alan Young Show, The Donald O'Connor Show, and Father Knows Best. He was the child lead on the soap opera Dr. Paul and the voice of Chef Boy-Ar-Dee for two years, both on radio. His stage career began at the Pasadena Playhouse at age six. Lonnie landed his first guest star role as the title character on a segment of The Range Rider and the same year, his eighth, he performed his first stage lead in The Strawberry Circle. His film roles include Queen for a Day (1951), Hans Christian Andersen (1952), The Greatest Show on Earth (1952) and Apache (1954). His early television commercials include Space Patrol and The Lone Ranger. Mickey Mouse Club. In 1955 he was signed to a seven-year contract by Walt Disney Studios as one of twenty-four original Mouseketeers. He was made a member of the show's first string unit, the Red Team, and appeared in the show's Roll Call and Alma Mater segments daily for the first two seasons. (A facial injury suffered during rehearsal kept him off-camera during the filming of Roll Call and Alma Mater for the third season). 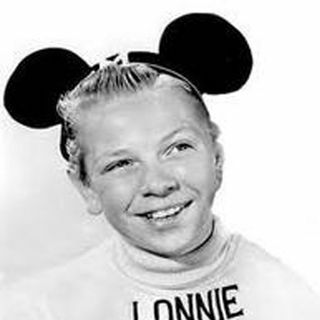 While on the show Lonnie performed in skits and musical variety numbers, both as a soloist and with others. He was generally acknowledged to be one of the show's three top dancers and his slightly husky singing voice caused other Mouseketeers to nickname him "The Velvet Smog" for at twelve he also resembled "The Velvet Fog", singer Mel Tormé.After The Mickey Mouse Club stopped filming in 1958, Burr finished high school, turning fifteen a few days before getting his diploma, and achieved a B.A. and M.A. in Theatre Arts from UCLA by age twenty. He then completed a year toward a Ph.D. in English Literature. He resumed performing in the 1960s in plays and musicals including Broadway, films, television, commercials and industrial films. His 25 films include Sweet Charity (1968), The Hospital (1971), The Prisoner of Second Avenue (1975), Hook (1991), Lionheart (1991), Newsies (1992), Mr. Saturday Night (1992), and Police Academy: Mission To Moscow (1994). His over 60 TV credits as an adult include guest roles on The Beverly Hillbillies, Hill Street Blues, Hunter, a recurring role on Falcon Crest, Murder She Wrote, Chicago Hope, L.A. Heat and Homicide: Life on the Streets. Burr also has a total of over 100 radio performances. His 49 stage roles range from Mack and Mabel on Broadway, the first National Company with Joel Grey and the Las Vegas production on his own of George M!, the Los Angeles company of 42nd Street and Tamara. Burr published articles on various subjects for eighteen national and regional magazines, newspapers such as the Los Angeles Times, The Village Voice, The Washington Times, and Cincinnati Enquirer, and also for e-zines. He has written for the screen, TV and has had 22 produced radio scripts that aired in the U.S. on a 500-station syndicate for Heartbeat Theatre and American Radio Theater. Burr also appeared as a contestant on two game shows, The Big Showdown (1975) and Wordplay (1987). After losing in his second appearance on WordPlay, the celebrity panelists put on mouse ears and sang the ending theme version of the Mickey Mouse March.